June Fan Club Magazines - Misc. 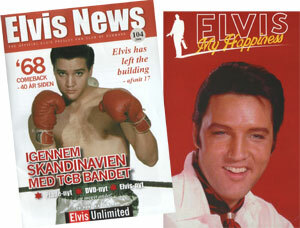 From Denmark we received the full color Danish Elvis News magazine (volume 104) from the Elvis Unlimited fan club. After a round-up of the news the magazine completes the series on the many venues where Elvis performed , the TCB concerts, reviews of most new releases, a a look back at the "Comeback Special" as the main article of this issue. The French Elvis My Happiness fan club send us their full color magazine (volume 64) packed with news and articles. The CD overview is the most complete we saw so far. Other articles deal with Elvis in France today, James Burton in Paris, portraits of Jerry Schilling and Boots Randolph, interview with Ken Sharp and background articles on Elvis songs including the interpretations of others, Elvis mania featuring some nice memorabilia and more. For more information on the fan clubs, their magazines and subscriptions, go to our magazine section.